Despite still fighting a nagging ankle injury, I signed up for a cross-country 5K that was this past weekend: the Sweat Hope 5K. One of my dearest friends agreed to run it, too, and because it raised money for a great cause and promised to be my last race in my hometown for awhile (and because of its spectacular name, especially appropriate for me), I wanted to have as much fun with it as possible. The fun started a day early. I picked up my race packet Friday afternoon, and, having just come from a Girls on the Run (GOTR) event, was sporting my GOTR coach’s t-shirt. When I arrived, several folks greeted me with enthusiasm and remarked on my shirt. It turns out that the race organizer (Jessica Ekstrom—also the CEO/Founder of Headbands of Hope) and her sister had been in the very first Girls on the Run. The very first season! The one that started it all. Both girls are grown now, and they were both at packet pick-up Friday. They joked that they must have been the reason GOTR kept going. I walked away wondering how many other success stories such as theirs had come out of GOTR. My new “Sweat Hope” headband with a sticker from Saturday’s race. I thought my happy Fall mum was the perfect place for this shot. On Saturday, the fun continued. Although I didn’t run as well as I had hoped and had to walk the big hills on the course, it was a beautiful day and a good excuse to spend time with my friend and her husband. I emailed Ekstrom after the race to congratulate her on such a great inaugural race. This was a great race, in large part because it was so well organized. The race started on time (yay!). It had great volunteers along the course and at the finish (yay!). There were great sponsors who were present with goodies for all of us (including a yogurt parfait station complete with dairy and vegan yogurt — double yay!). There was even a sack race for kids after the main race wrapped up. I don’t know if Ekstrom plans to organize future Sweat Hope races, but if she does (and I hope she will), you runners out there won’t be disappointed. Ekstrom kindly agreed to share a little about her experiences as a founding member of the GOTR family and in her role leading her own company. Headbands of Hope makes and sells fantastic headbands (seriously, runners, these things do not slip while you’re running). For every headband the company sells, it donates a headband to a girl with cancer and also gives $1 toward cancer research. Ekstrom is gaining national attention for her work, and I wanted to know more of her story. Ekstrom says she has always been competitive, but being part of a team of runners felt different. She figures that she was seven years old when she and her sister first participated in GOTR. She still remembers the games and team-building activities and says GOTR was a great program to do with her sister. They went through three seasons together, and through GOTR, Ekstrom says she learned to focus less on winning and more on working together with a team to accomplish goals. As a young woman studying to be a journalist, that lesson stayed with her, and she knew she enjoyed helping others but just hadn’t found the way that would be uniquely hers. Ekstrom says that girls struggling with cancer not only face a battle for their lives, they also fear losing their feminine side. Something as simple as a new headband can change the way they see themselves when they look in the mirror. (Check out the video on today.com that features Ekstrom and Headbands of Hope. The giggles and smiles as these girls see themselves in their new headbands are priceless.) Those reactions are Ekstrom’s favorite part of her job. 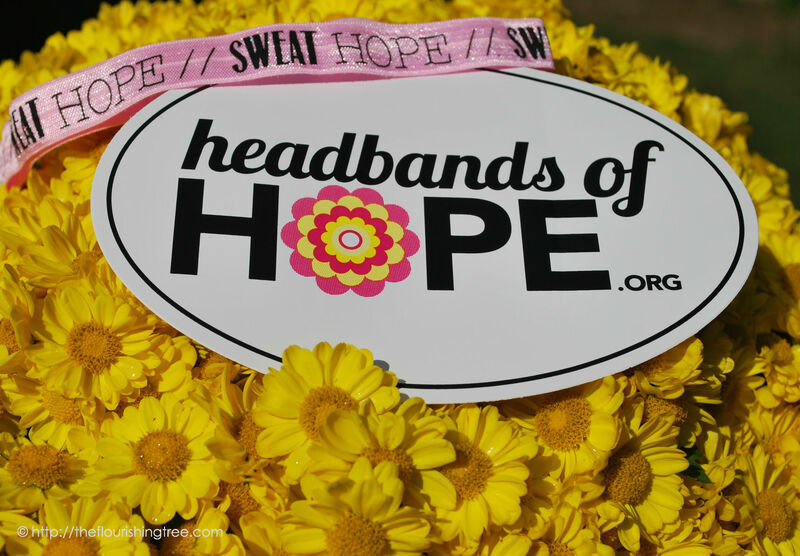 In the last two years, Headbands of Hope has donated more than $20,000 to cancer research and donated 20,000 headbands to girls who need a moment of hope, a reminder that they’re not fighting their battle alone and that cancer hasn’t robbed them of their chance to feel like a girl again. I bought my first headband a year ago at a race expo, and have bought several more since. I can’t say enough great things about them, whether you want to run, dance, jump or simply lounge around wearing them. They’re made by a team of great folks in Bismarck, ND, and you can buy them online if you don’t find them at your local running store or race expo. I circled back with Ekstrom to ask about the idea behind the Sweat Hope 5K. Ekstrom says she “wanted a way to bring the community together in a healthy way and make a change. The 5k seemed like the perfect way to do that.” She is bringing community together in so many ways, in ways that promote health and hope and a few giggles along the way. This entry was posted in flourishing tree and tagged 5K, children's cancer, community, girl power, Girls on the Run, GOTR, Headbands of hope, hope, Jessica Ekstrom, joy, running by hopesquires. Bookmark the permalink. Was very interesting, and I love headbands. Maybe they will have some at the next run in Sarasota. It is truly amazing how many ideas for helping out in some way can be found with just a little imagination and some initiative. Love, E P.S. I hope you and Chris got the package today. The company makes some really cute headbands. I’m not sure how widespread they are, but I hope you find some near you soon. You can also order them from their website.